It’s so quick to make multi-layered flowers like this one when you have punches to help you out. I used a watercolor brush and Crisp Cantaloupe ink to color some watercolor paper, which I punched out with the Pansy punch. I also used the new Dictionary background stamp to stamp Baked Brown Sugar ink on the Baked Brown Sugar card stock. The splatters come from the Gorgeous Grunge stamp set. This is a note-card sized card — 3-1/2″ x 5″. Last week was my last as a guest designer for the Paper Players. I don’t really have to worry about withdrawal too much though, as I still plan on participating in many of their challenges as a participant. You just won’t see my cards for that posted here on Sundays anymore. You can go check out what the challenge for this week is here. Stamp sets that have coordinating punches are so much fun! They make creating so much easier and faster. 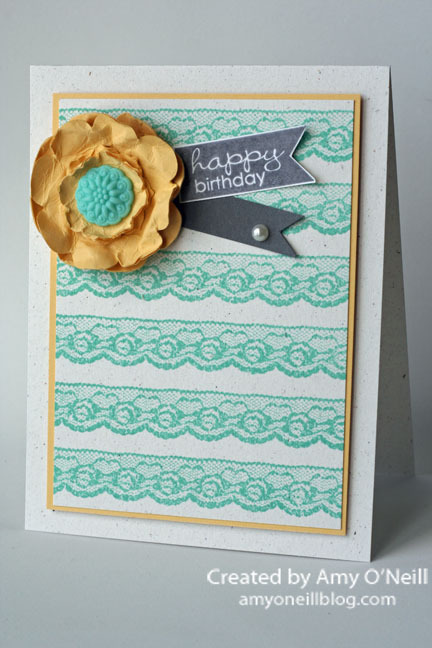 I have been enjoying playing with the new Flower Shop stamp set and the coordinating Pansy Punch. I also used the new Dictionary Background stamp on the Soft Sky card base. Love this! I was also playing around with some different color combinations, and I decided that I really like this one — Soft Sky, Rich Razzleberry, Blushing Bride, and Smoky Slate. I threw in a little Pear Pizzazz for the leaves as well.